A few weeks ago on a chilly but sunny October day, my husband and I spent the afternoon driving around the local countryside. Not really having a plan in mind we stumbled across Primitive Designs and had to stop to check it out! Primitive Designs is a unique shop that sells exotic and hand crafted pieces from around the world. This amazing shop has an abundance of carvings, tiki huts, furniture, pottery, jewellery, clothing and pretty much anything and everything unique you could possibly be looking for! And of course if that doesn’t draw you in, the massive hand-built Transformers guarding the entrance will! After doing some shopping, we continued on to Otonabee River to do some hiking. …and a very curious emu! It was the perfect way to spend a Sunday! Unfortunately I haven’t picked up my camera enough this year. Life just seems to always get in the way. I took a walk around the neighbourhood last week and although it’s too early around here for the leaves to start changing I was able to still get a few interesting shots. This was my favourite photo of the day. Before heading out, I was watering the garden when I noticed something moving through the mist. I turned off the water and took a closer look. 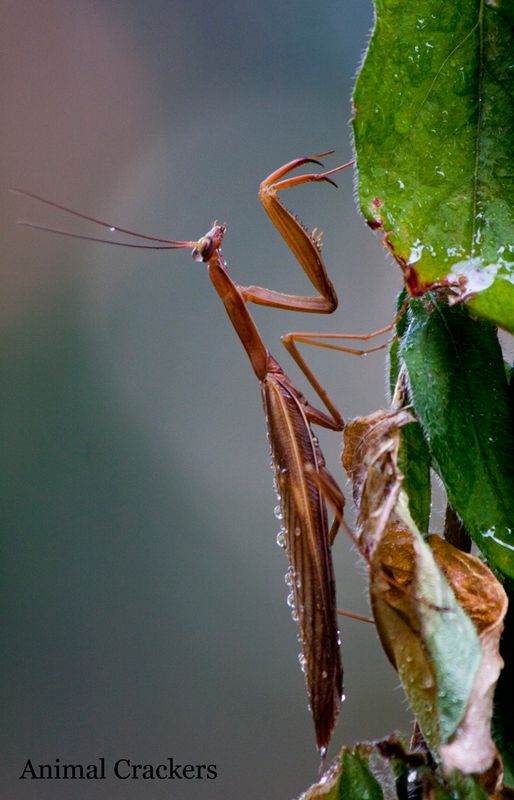 It was a female Praying Mantis! I ran inside, grabbed my camera and began shooting. I’ve only seen 3 in my entire life and felt privileged she had chosen my garden to be in! Even though she’s an insect, watching her clean off the droplets of water made me feel like I was watching something so much more special than that! Amazing! 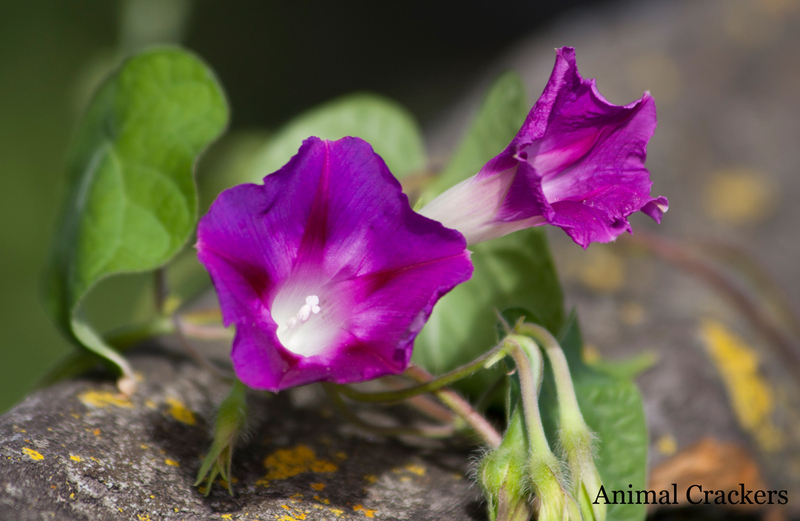 A neighbour has these gorgeous Morning Glories growing all over her front fence. They’re all different colours and look so pretty I just had to take a few photos. One of my favourite flowers and yet I can’t seem to grow them! Too many squirrels around! 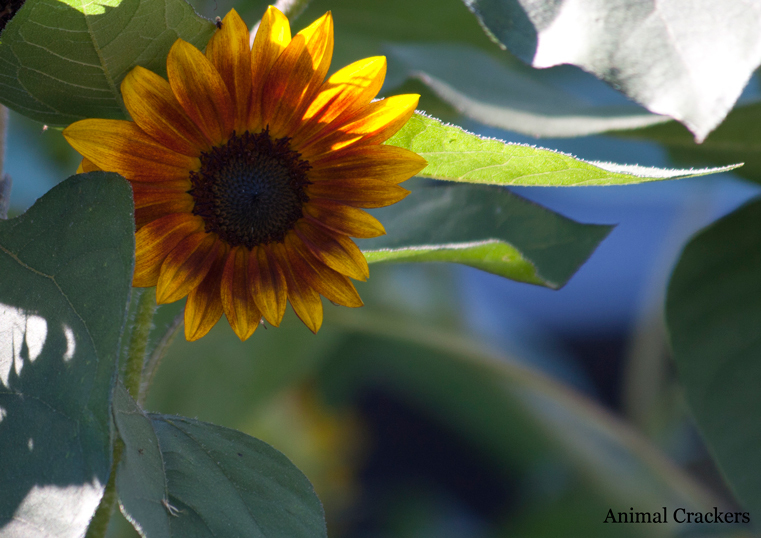 This Sunflower was part of a small gardenful, each over 5 feet tall! 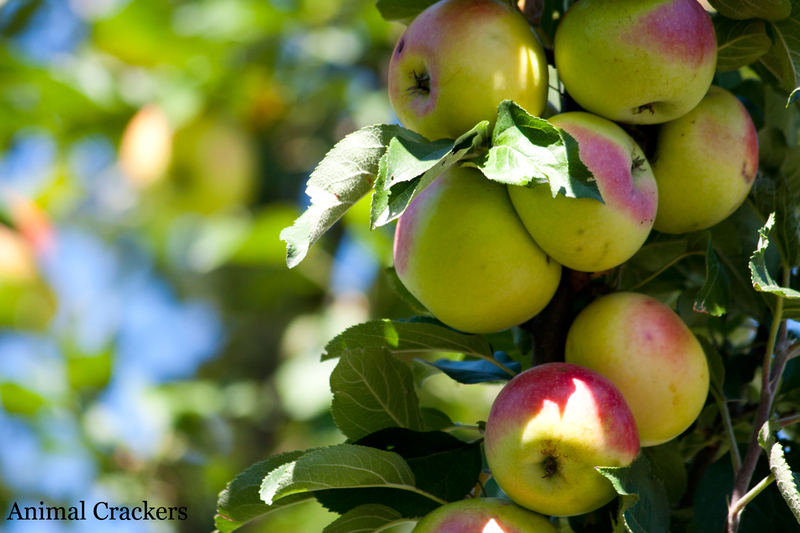 This apple tree was actually in someone’s backyard but was so large the branches full of apples were towering over the sidewalk. They looked delicious! And the rest of these were actually from a bouquet of ‘Just Because’ flowers Hubby brought home for me. A beautiful arrangement of Gerber Daisies, Lilies and other small flowers, I couldn’t wait to photograph them. 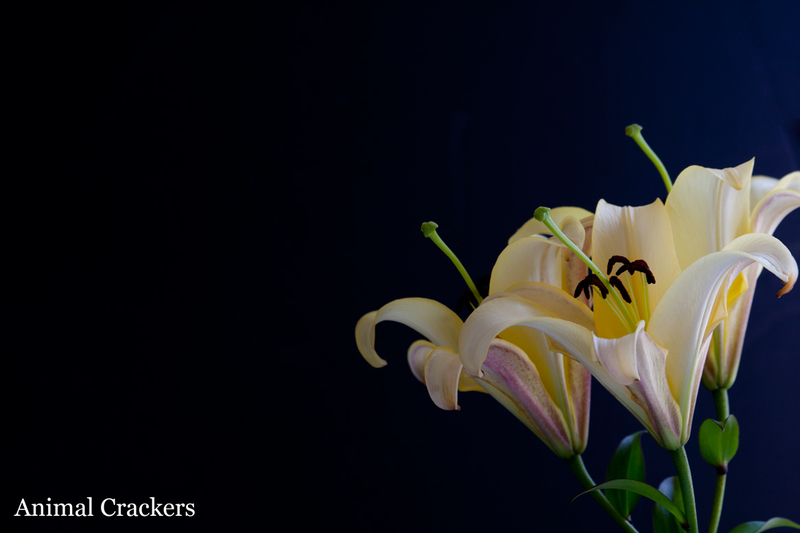 I used several different backgrounds but the dark really made the colour in the flowers pop. 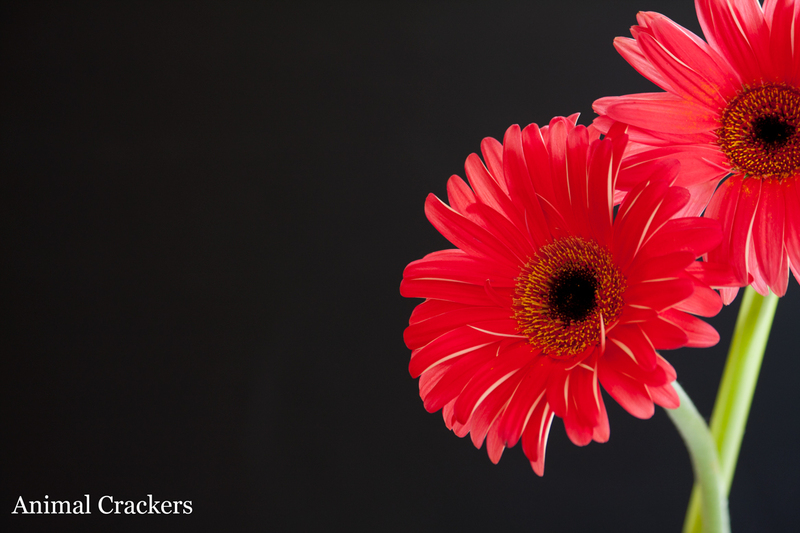 The two Gerber Daisies. Hubby said he just walked around picking random flowers he thought I’d like. I’ve never had a bouquet with Gerber’s in them, I was pretty excited! Lilies have always been my favourite flower. Tiger Lilies were our wedding flower. 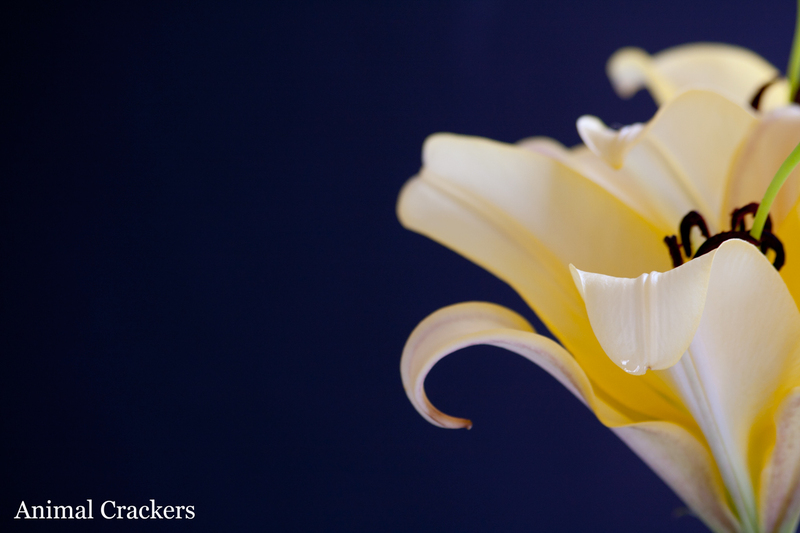 A close-up of one of the Lilies. 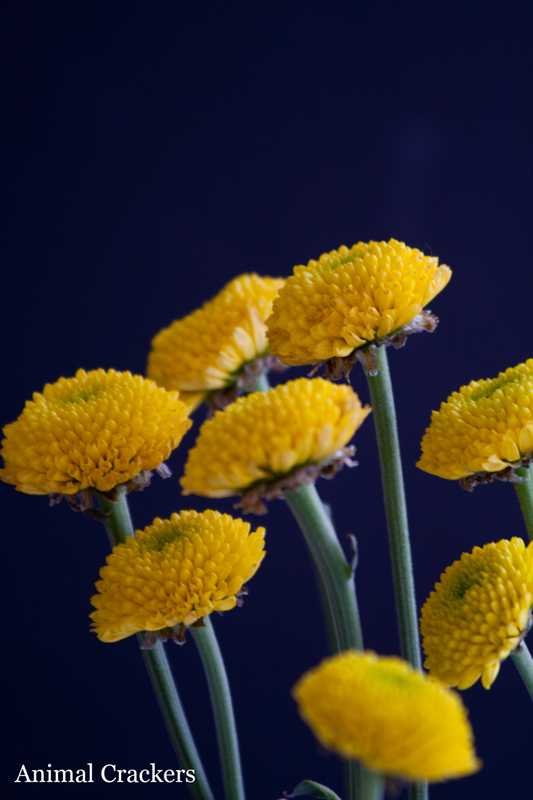 Photographing flowers is so easy! Since they’re so small, coloured bristol board is the perfect backdrop. 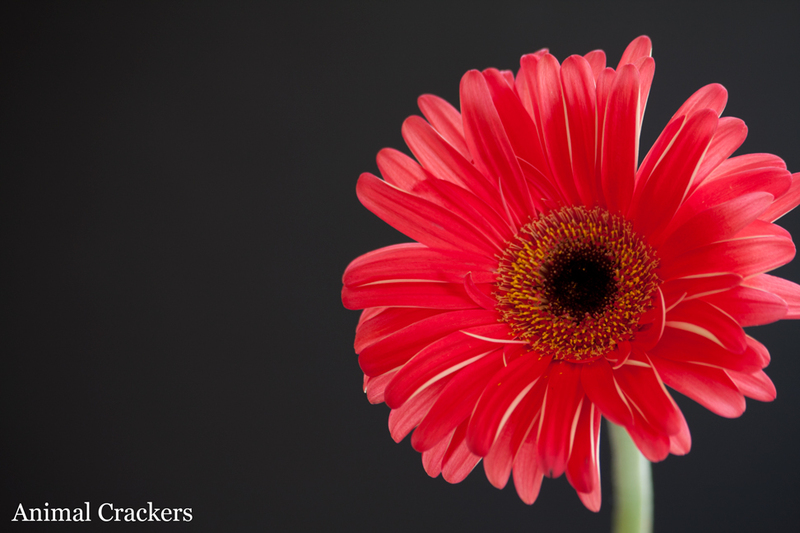 Pick out the flower you want to photograph and put it in a tall cup or vase. Put the bristol board about a foot behind the flower, set up your tripod and your all set! I love flowers but I’m not exactly sure what these are. They look like a type of Marigold to me or maybe they’re a wildflower. Either way they complemented the arrangement perfectly. Hopefully I’ll be able to get out again soon and get a little creative with the changing season. Fall Days, Vaycay and Outdoor Bunny Play! Man did I feel great last night! Still fighting a throat infection but I started my stay-cation at 4:31pm yesterday afternoon! Hubby only has the weekends off with me so although it would have been nice to spend the week with him, I now have lots of time to catch up with the ‘kids’. After watching our favourite tv shows, Hubby and I snuggled and watched a movie on the big tv. It felt so good to sleep in this morning and wake up when I wanted to wake up (which was a little before 10am). Hubby was working the closing shift at work so I told him to stay in bed as long as he wanted and I got up, fed the dogs and took them on a walk. What a beautiful day! It got up to 22C, was bright and sunny without a cloud in the sky. Absolutely amazing! After I had gotten Hubby some breakfast, made his lunch and sent him packing, I made a grocery list and walked over with my cart to the store. This year Hubby and I have decided to make a tofurky for Thanksgiving. They’re pretty pricey for just the two of us but we interested to know if it’s any good. I actually really never thought about cooking one before but I’ve had a few people tell me they go over well in their house so we shall see. By the time I got home, unloaded the groceries, took the dogs out and made some lunch, it was mid-afternoon. It was still nice and warm but the sun was off the backyard so I set up some fun toys for the bunnies and brought them out for a few hours of fresh air and exercise. Rocky was pretty excited to get outside. Rocky and Honey loved the long grass for lounging, hopping and nibbling! I’d say they were pretty comfy! Willow’s turn! Of course she kept hopping up to me for snuggles. Hey whatcha up to there Ollie? There were many holes like this around the backyard, Ollie was on a mission to dig it all up! I let them stay out until the sun had set and it was starting to get dark. I love letting them play outdoors because it takes minutes to set up and take everything inside, there’s no mess to clean up afterwards and it gives them a larger open space to play in. And don’t worry, I spend the entire time outdoors with them to make sure they stay out of trouble and nothing is eyeing them up. And now I must get to some baking. I’ve had another request for some nanaimo bars!